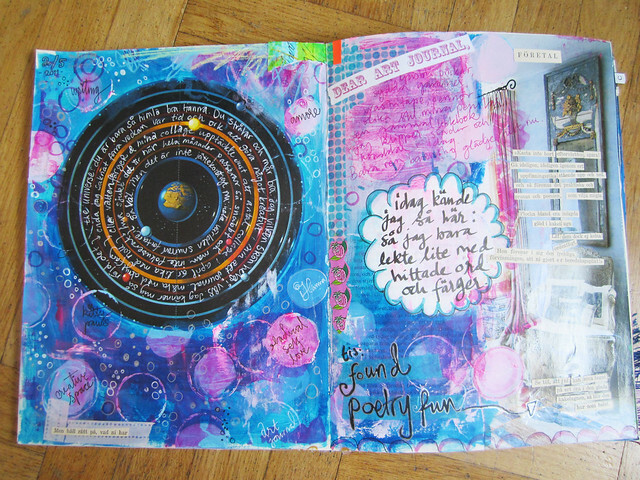 Here is another spread with lots of circle fascination, where I’ve also played with cut out words and created my own (Swedish) Found Poetry. I love these little poems! They make me smile because the language is old fashioned and the don’t make (much) sense. Perfect found poetry, right? 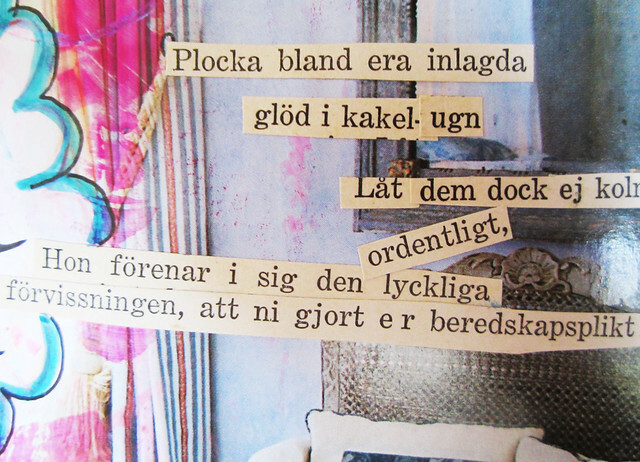 My found poetry is funny, but it will probably not make much sense at all to most of you because the words are in Swedish. :-) But it’s rather pretty to look at too. And maybe they will inspire you to cut out your own words and start playing with them? 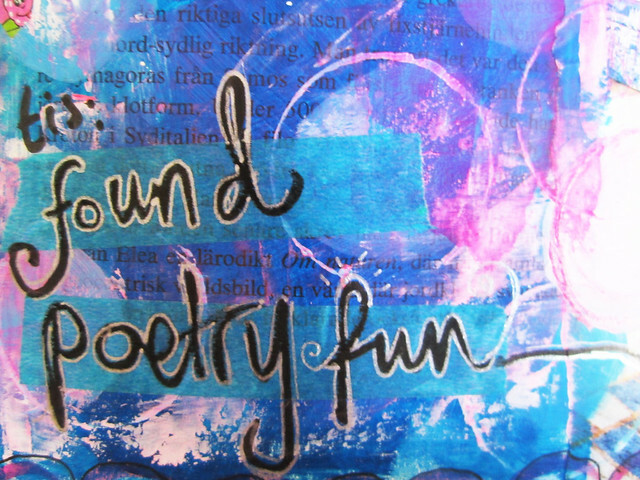 Create your poetry with a few cut out words from a magazine or used book. Use one that you’re not interested in reading or saving. Look for whole phrases that you find interesting or that speaks to you and save them. Cut them up or use as they are. You can create whole poems this way, but also add visual interest with a few words. Cut out words that are beautiful to say out loud, or that have special meaning to you. Have you tried writing your own “found art poetry” yet? 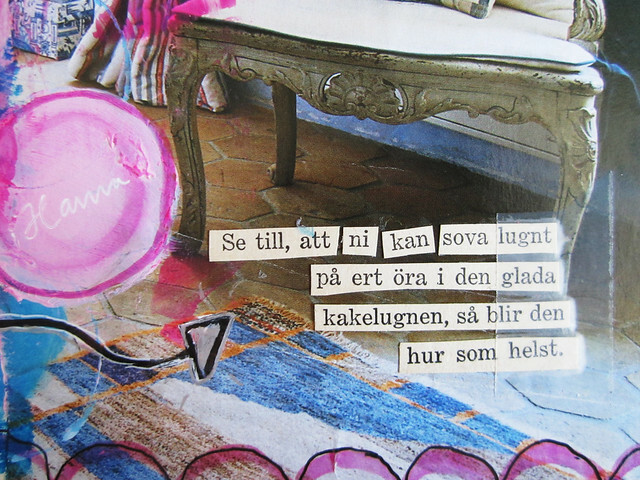 This entry was posted in Art journaling and tagged art journal peek, poetry, prompt, Swedish. Bookmark the permalink. Found poetry is not only profound and fun, but it taps into some very deep places that need to speak in your soul. What gorgeous pages! I love your found poetry. 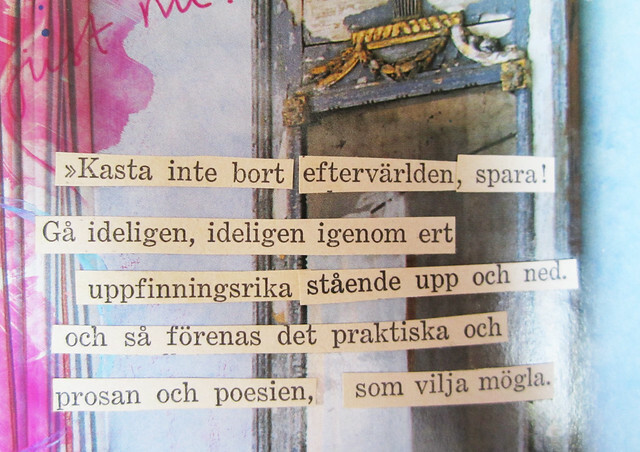 I don’t read Swedish, but I love the little word snips on the page and the idea of it anyway. I have a bag of words somewhere that I lovingly cut up from a magazine article filled with beautiful words and images. Sometimes I pull one or two out to inspire me to write something. I hadn’t thought of using them in a collage. I might just have to try it. I love this kind of play !!! Words are my favorite ! Oh how I wish I spoke and read Swedish ! It looks delicious ! Happy poetry hunting, Beautiful Artist Hanna ! i will have to try this! such a vast array of possibilities. thanks for the inspiration. Oh Hanna I love your circle found poetry page! The layers are fantastic !